Outside the classroom, MassBay offers many services and activities that can enhance the college experience. Diverse co-curricular activities are available to foster a sense of community and to afford students the opportunity to seize leadership and decision-making roles. The MassBay Student Handbook is an important resource for students, describing in detail various services available, as well as rights and responsibilities. The condensed Handbook includes an academic year calendar/ planner, and the full Handbook can be found online at www.massbay.edu. MassBay is a member of the Massachusetts Community College Athletic Conference (MCCAC) and the National Junior College Athletic Association (NJCAA). MassBay student-athletes compete for state, regional, and national honors and championships. All MassBay students are admitted free to all home games. Other club sports may be offered as well, depending on student interest. All full and part-time students are invited to participate in these activities. Offerings may include ice hockey, tennis, indoor soccer, and volleyball. The MassBay Recreation & Wellness Center (RWC) is home to numerous recreation and physical fitness opportunities, offering a multi-purpose gymnasium and a fitness & wellness room with exercise equipment. The RWC signifies the College’s commitment to provide an environment that promotes the total fitness and wellness of its students. The RWC is available free of charge to students. A campus identification card is required to use the facility, its equipment and locker rooms. Student Government, Clubs and Organizations All enrolled students at MassBay are members of the Student Government Association (SGA). The SGA serves as an advocate to address student concerns and sponsors a variety of student activities and student-interest programs. The elected governing body of the College SGA is the Student Senate, comprised of representatives elected by the student body at-large. All clubs and social organizations that receive funding are under the jurisdiction of the SGA. A copy of the Student Government Association Constitution is included in the MassBay Student Handbook. Social, cultural, and recreational activities, as well as trips, outings, and informal get-togethers, are planned by committees of the Student Senate and the Office of Student Activities each semester. Students must be in good academic and disciplinary standing to assume and continue to hold a leadership position in the SGA or in a club. Contact the Office of Student Activities or visit www.massbay.edu/studentactivities for a current list of active clubs. Students may join an existing club or start a new one by contacting the Office of Student Activities. The “OneCard” is the official identification card of MassBay Community College issued to every student and employee. The OneCard is an essential key to campus life. In addition to being an official form of identification, it is used for other College services. The OneCard is used to access the Recreation and Wellness Center, and is also a Minuteman Library Network card. MassBay OneCards are available to MassBay students registered for at least one credit and to College employees. The “OneCard” must be carried at all times and may not be used by anyone other than the student named on the card. It remains the property of the College and must be surrendered to the College upon demand. When necessary, students are required to identify themselves and to show their MassBay OneCards at the request of a College official (this includes, but is not limited to, admission to exams, buildings, and College events). Alteration or use of the card for any unauthorized purpose will result in confiscation and/or disciplinary action. For more information; please contact the OneCard office: onecard@massbay.edu or call either campus (Wellesley Hills) 781-239-2518 (Framingham) 508-270-4065. Textbooks for classes are available for purchase or for rental from the bookstores located on the Wellesley Hills and Framingham campuses, and online at www.efollet.com. Used textbooks may be available at a 25% savings off the new book price. Many textbooks are also available in digital format. A book buyback program throughout the year is also offered, where students can sell their unwanted textbooks for cash (market prices apply). The bookstore offers extended hours during the first and last week of each semester. Parking is available free of charge to MassBay students displaying a valid MassBay student decal (available from Public Safety). Please park in lots designated as “Student Parking.” MassBay offers limited shuttle service to and from the Riverside MBTA stop to the Wellesley Hills and Framingham campuses. Current schedules are distributed during orientation and are available in the Office of Student Development and on the College website throughout the year. Licensed mental health counselors are available to help enrolled students address personal issues that may negatively affect their academic and personal well-being including anxiety, stress, depression, relationship issues, and life balance. Counseling Services provides individual therapy for students and makes referrals to specialists in the area. Services are private and confidential as defined by law. Counseling Services also provides consultation to faculty and staff about student mental health issues and offers educational programs on a variety of topics throughout the academic year. Students may call Counseling Services at 781-239-3142 or come to the Office of Student Development in Wellesley Hills or Framingham to make an appointment. MassBay career counselors provide on-going career planning assistance for students and alumni seeking career direction. Students have access to current information on potential careers. They are encouraged to have regular contact with counselors throughout their college experience to strategize and to explore their choices. Printed resources and career software programs are housed in The Office of Career & Internship Services on both campuses. These tools help students make informed decisions about career and educational goals. Career and interest inventories, including the Myers-Briggs Type Indicator, are available for all students and alumni. Job placement assistance is available through theThe Office of Career & Internship Services for all students and alumni. Students may register online to access job postings and to meet with a counselor to develop an individualized job search strategy. Workshops and individual assistance with résumé writing, interviewing, and job search strategies are also offered to help with the job search. Career fairs and other on-campus recruiting events are held throughout the academic year. The Office of Career & Internship Services can also assist students in finding internship opportunities that fit their career path. Internships are a valuable experience that allows students to gain experience in a particular field of interest and develop professional contacts. 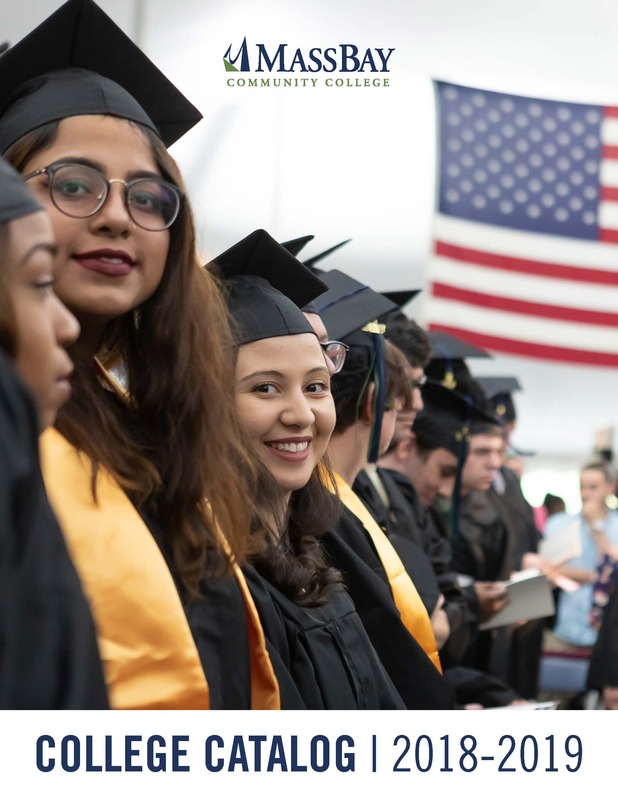 MassBay celebrates our diverse College community. The College is committed to supporting the academic success of international students by providing services to meet their specific needs. The Office of Admissions offers comprehensive support for international students on both academic and personal levels. Services include but are not limited to international admissions, immigration compliance and advice, orientation and informational sessions, work authorization, and cultural adjustment and academic support.